Governor Terry Branstad this morning said it is “likely” he will approve a bill that expands Iowa’s medical marijuana law. Iowa’s current law which decriminalized possession of cannabis oil for treatment of chronic epilepsy expires June 30. The bill that passed the legislature early Saturday morning would sanction operations to grow marijuana, produce cannabis oil and dispense it in Iowa. 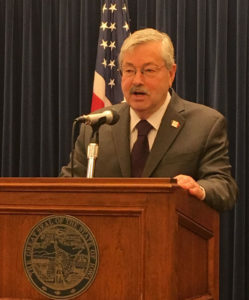 Iowa doctors could prescribe cannabis oil for treatment of a wider range of 15 chronic and debilitating conditions if Branstad signs the bill into law. Supporters of the bill say it will take up to a year and a half to establish the state-sanctioned operations that will produce the cannabis oil for Iowa patients. Until then, Iowans who get an Iowa doctor’s recommendation for cannabis oil will still have to get it from out-of-state. “We continue to ignore the pleas of people in our state that have illnesses that none of us would want and we’re going to claim victory,” Bolkcom said Saturday. Schneider and Bolkcom made their comments at about seven o’clock Saturday morning. The medical marijuana bill was the final sticking point to be resolved before the 2016 legislative session concluded at 7:16 a.m. Saturday.